As the year closes, we’re highlighting what we accomplished thanks to our members and volunteers. We’ll be publishing a blog each day covering the successes enabled by our members’ and partners’ investment in us. Read all our highlights here. Members of the Bicycle Coalition of Greater Philadelphia, the Philadelphia Vision Zero Alliance, State. 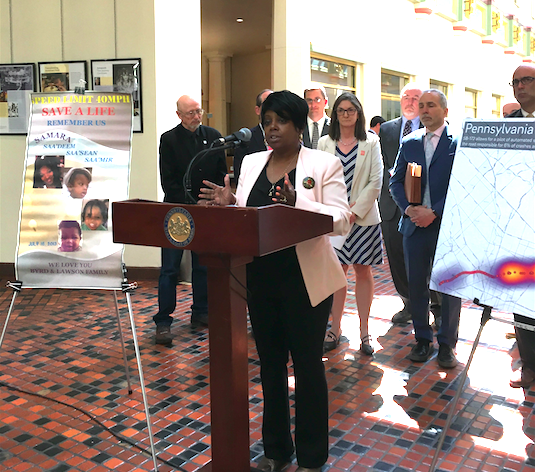 Rep. John Taylor and Philadelphia resident Latanya Byrd gathered in the East Wing of the state Capitol on Tuesday to call for increased pedestrian, bicyclist, and motorist safety on Pennsylvania roads. Speaking from the state Capitol, Alliance members called upon the Pennsylvania state Legislature to pass several bills — especially, it was noted, Senate Bill 172, which would allow Philadelphia to implement proven safety measures along Roosevelt Boulevard in Philadelphia. Roosevelt Boulevard is Pennsylvania’s most dangerous road, accounting for 10–15 percent of all vehicular traffic deaths in Philadelphia, yearly. Between 2013 and 2017, 63 people died on Roosevelt Boulevard, 27 of whom were pedestrians. Roosevelt Boulevard passes through many different types of neighborhoods, from far Northeast Philadelphia, through North Philadelphia, to parts of Northwest Philadelphia, and the victims of the Boulevard represent every demographic of the city. In attendance, and speaking in the Capitol was Latanya Byrd, whose niece, Samara Banks, and three of Banks four children, was killed on Roosevelt Boulevard by speeding drivers in 2013. Byrd has since become an advocate for a safer Roosevelt Boulevard in Philadelphia. Her voice would prove vital to our work throughout the year. In an effort to better understand how Vision Zero intersects with race and poverty, the Bicycle Coalition undertook some geospatial analyses, digging deeper into the fact that 50 percent of traffic deaths and severe injuries occur on just 12 percent of city streets. First, we identified Census Tracts where the percentage of residents living in poverty was greater than the overall percentage of Philadelphians living in poverty (25.9%). Next, we determined which of these Census Tracts have a higher percentage of nonwhite residents than Philadelphia as a whole (58.7%). Though rudimentary, these indicators allow us to look at what, if any, connection there is between poverty, people of color, and the High Injury Network. Additional analysis that further breaks down race into specific categories could further illuminate those who are most impacted by traffic violence. The City of Austin conducted such an analysis in their action plan. 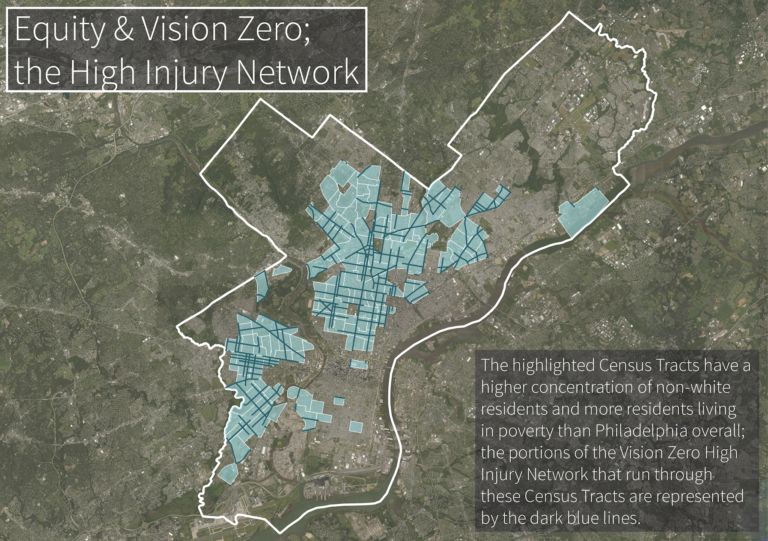 Our work revealed that while roughly 35% of Philadelphia’s street miles are located in these Census Tracts, this same geography accounts for almost 46% of the High Injury Network. So, almost half (46%) of the High-Injury Network lies in impoverished communities of color. We encourage the City to conduct further analysis of the High Injury Network as it relates to indicators of disadvantage, especially race, which is not addressed in the action plan at all; our analysis of race and the High Injury Network is narrow in scope and we know additional analyses are possible. Looking to other large cities also highlights additional cross sectional analysis with High Injury Networks. Los Angeles used a Community Health and Equity Index; Chicago used a health hardship index and is working to analyze other social indicators including vacancy rates and gun violence; the City of Austin’s Vision Zero Action Plan has a whole section dedicated to exploring who is affected by traffic deaths and injuries, looking at mode share, racial groups and poverty.